A British couple stranded in Singapore are trying to raise £140,000 to bring their premature baby home. 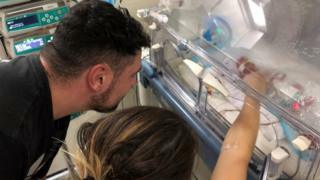 Ex-teaching assistant Chloe Wilkinson went into labour at 24 weeks pregnant while travelling back from Australia with her partner Patraic Walsh-Kavanagh. She gave birth to son Lorcan, who weighed 1.9lbs (0.86kg), while waiting for a connecting flight home. They have been handed a Singaporean medical bill estimated at £140,000. They say their travel insurance, which was taken for the duration of their trip before they left the UK, does not cover pregnancy. Laws in Singapore mean they are unable to seek work to support themselves. Baby Lorcan is in intensive care, and the couple are now looking to crowdfund the medical bills. The couple left the UK in December 2017 to go travelling around Asia before working in Victoria, Australia. They found out Miss Wilkinson, 30, was pregnant last November and were waiting to tell their parents about the surprise pregnancy once they got back home. However, Miss Wilkinson was rushed to hospital on 19 February during a two-day stopover in Singapore. Mr Walsh-Kavanagh, 27, a former plumber from Newark, Nottinghamshire, said: "All the doctors and nurses seemed very concerned. "After numerous tests, it was found that she had an infection, so she was started on antibiotics and medication to reduce contractions and prolong labour, to give baby the best chance of survival." On 21 February, the couple were told that Miss Wilkinson had started dilating at just 24 weeks and flying home was no longer an option. Baby Lorcan was born on 26 February, and the couple are facing a three-month stay in Singapore until he is well enough to travel. Miss Wilkinson, from Lincoln, said: "Lorcan's been fighting with all his might and we are bursting with pride at the strength he is showing so far. "However, we are on our own, a 14-hour flight away from our family and friends, and it has been a very difficult start to parenthood whilst Lorcan remains in hospital." The couple, who are currently living in a shared flat close to the hospital, are using money they had saved in Australia to be by Lorcan's side.